Representative Alexandria Ocasio-Cortez expresses the messages behind an urgent video on climate change released Wednesday by The Intercept. The video, A Message From the Future with Alexandria Ocasio-Cortez, was produced by The Intercept‘s Naomi Klein. Narrated by AOC, the short film is presented as a look back to the present day from a future in which the Green New Deal passed Congress and reshaped America and the planet for the better. The video features art from Molly Crabapple and was written by Ocasio-Cortez and Avi Lewis. It was co-directed by Kim Boekbinder and Jim Batt. 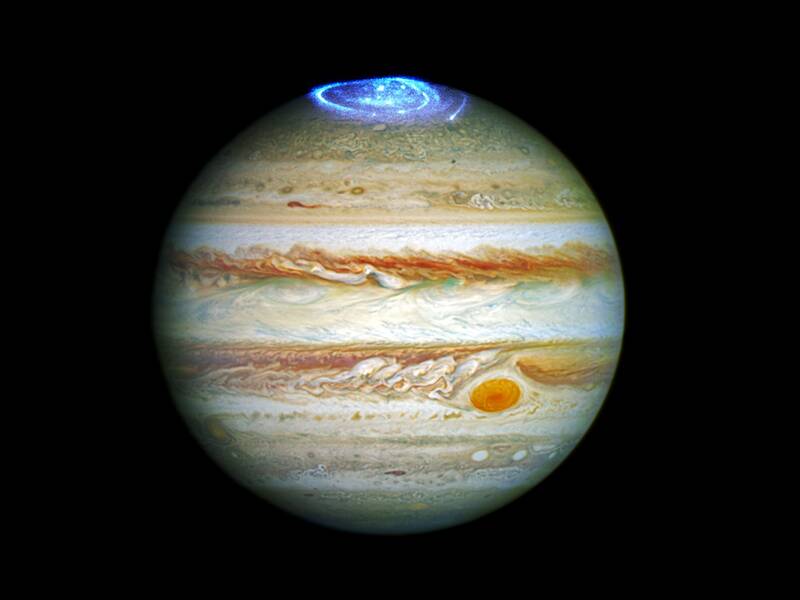 Observations with the Subaru Telescope, a Japanese 8-m telescope on Mauna Kea, Hawaii, show that the aurorae at Jupiter’s poles are heating the atmosphere of the gas giant, and that it is a rapid response to the solar wind. Aurorae at Earth’s poles occur when the energetic particles blown out from the Sun, the solar wind, interact with and heat up the gases in the upper atmosphere. The same thing happens at Jupiter, but the new observations show the heating goes 2-3 times deeper down into its atmosphere than on Earth, into the lower level of Jupiter’s stratosphere (upper atmosphere). Understanding how the Sun’s outpouring of solar wind interacts with planetary environments is key to better understanding the nature of how planets and their atmospheres evolve. What is startling about the results is that scientists were able to associate the variations in the solar wind and the response in Jupiter’s stratosphere, and that the response to these variations is so quick for such a large area. Within a day of the solar wind hitting Jupiter, the chemistry in its atmosphere changed and its temperature rose, the astronomers found. Such heating and chemical reactions may tell us something about other planets with harsh environments, and even early Earth. The results appear in the journal Nature Astronomy. In a betrayal worthy of Game of Thrones, the Ecuadorian government revoked their offer of asylum to WikiLeaks founder Julian Assange. Without Assange, we would likely not have the Trump regime, and without a Donald Trump, Assange would likely not have been hauled out of the Ecuadorian embassy, under arrest by British authorities responding to an extradition request from the Trump administration. The same Trump administration Assange worked so tirelessly to elect. And thus, Assange is learning the price of putting any faith in Donald Trump. The Department of Justice released a statement on the charges against Assange making it clear that he is not being held for anything in connection with the 2016 election, but for his actions in 2010 when WikiLeaks published a series of nearly 750,000 classified or diplomatically sensitive documents related to the war in Iraq. On a legal basis, this seems to remove the government’s action from the First Amendment realm where Assange and WikiLeaks would enjoy the same protections as publishers in other cases where classified documents were revealed to the public. However, that doesn’t mean this case does not have profound implications, or that the government’s actions here are in any sense on solid ground. It’s not clear that Assange actually provided Manning with any material aid. It appears that the DOJ has latched onto a minor event during the publication of these documents and is trying to turn it into a point of prosecution expressly to avoid dealing with the idea that they’re engaging in an effort to suppress publication, which they are. On a moral basis, Assange’s actions in the 2016 election seem indefensible. He was clearly not acting in a position of a dispassionate observer, but in coordination with both the Russian government and the Trump campaign with the explicit intent of harming Democratic candidate Hillary Clinton. Assange was part of the Russian government’s program to help Trump. His actions were not just partisan, but deceptive. He knew the source of his information, and both the selections released and the timing of their release was done in a way to generate maximum benefit to Trump. He used stolen goods for the material benefit of Trump. It can’t be overstated how much Assange did this to himself. If he had turned himself over to Swedish authorities when they first called him in for questioning when he was accused of sexual misconduct in 2012, he would probably be a free man now. The charges against him were dropped in 2017, but even if he’d been convicted, his sentence would have been light, thanks to Sweden’s progressive sentencing guidelines. If he’d stayed out of the 2016 election, he would have had little to fear from a President Hillary Clinton. That conclusion may surprise a lot of people given that Assange has long stoked the idea that he was in serious danger of extradition for his role in the Manning leaks, which is exactly what the Trump administration now hopes to prosecute him for. But Obama and then-Attorney General Eric Holder, while not happy about the leaks of classified information, also decided against pursuing a case against Assange in 2013. This was out of fear that it would set a precedent that would be used against other journalists. A Clinton administration (probably) would have respected that conclusion. But Donald Trump isn’t a man known for giving back to those who help him. Prosecuting Assange will help Trump further his attacks on the First Amendment, so there’s little chance he’ll feel constrained by gratitude for Assange’s role in getting him elected in the first place. Assange also makes a useful target because he has few friends left. By helping torpedo Clinton in the 2016 election, he made bitter enemies out of the Democrats and many liberals who would otherwise be inclined to oppose efforts to punish independent journalists for publishing leaked government documents. That itself isn’t a very defensible position, but that’s why we’re in the Worst Timeline. It’s hard in our black-and-white age driven by social media reactions, to have a nuanced discourse about how Assange can be disliked for helping to impose the Trump regime upon all of us, but still feel that the doesn’t warrant being arrested. His leaks in 2010, exposing the cruelties of the ongoing “war on terror” was critical muckraking journalism and probably did a great deal of long-term good. Among other things, it put pressure on Barack Obama to move back toward the more non-interventionist image that he had campaigned under in 2008. Donald Trump owes a lot to Julian Assange, but as usual, once he felt that Assange had outlived his usefulness to him, Trump threw him to the wolves, joining such company as Jeff Sessions, Rex Tillerson, John Kelly, James Mattis, etc. When asked about the arrest, Trump absurdly said, “I know nothing about Wikileaks. It’s not my thing. It’s not my deal in life.” That, of course, is not true. During the 2016 campaign, WikiLeaks was candidate Trump’s main squeeze and he its most high profile booster. He constantly bragged about Wikileaks helping him and tweeted praise of Wikileads and Assange and retweeted stories about the leaked emails over a dozen times.